Callie Jones wants two things. She wants to be a writer. And she wants to be part of a group. 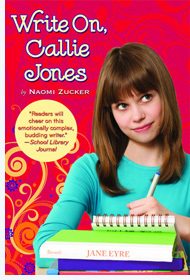 When her friend—and sometime rival—Shane Belcher tells her that there’s going to be a new middle-school newspaper, Callie feels as if a fairy godmother has granted her wishes. And, for good measure, brought her Mr. Fischer, the newspaper advisor and a man so handsome he makes Callie’s chest crinkle. That crinkle becomes a cramp when Principal Nolan—known to all the kids as Mr. No-Man—vetoes Callie’s first news story. But Callie’s not the only one in trouble; Callie sees one member of her newspaper team being bullied. Then Callie finds herself being bullied when Mr. No-Man shuts down the school paper. At Mr. Fischer’s suggestion, the kids start up their paper on line. Now Callie is free to write, not just news reports, but also pieces that express her opinions—of which she has many. And one of those opinion pieces leads to quite unexpected consequences.